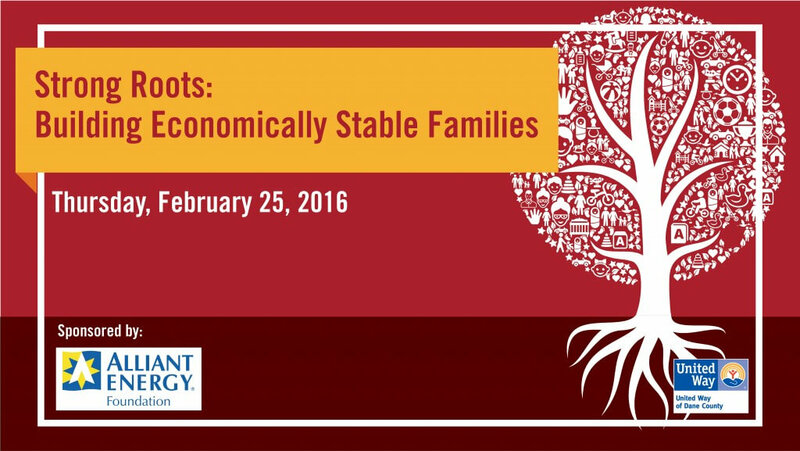 (Feb. 25, 2016) Madison, Wis. – Today, local leaders began a conversation with the community on how, collectively, we can implement strategies to reduce poverty. Poverty is one of the largest challenges children and families face in Dane County. United Way of Dane County convened the Delegation to Create Economically Stable Families in 2014, led by UW-Madison Chancellor Rebecca Blank and former City of Madison Police Chief Noble Wray. Today, the delegation shared its recommended strategies to increase the number of young families, particularly families of color, to become economically stable. Blank led a community conversation with leaders and the public at today’s Strong Roots: Building Economically Stable Families event, sponsored by Alliant Energy Foundation. The Delegation’s recommended strategies are part of a larger, year-long discussion on how the community wants to engage in reducing poverty and closing opportunity gaps. Civic, business and community leaders answered questions from community members on how they, along with the community, can take local approaches to reduce poverty in Dane County. Dane County Executive Joe Parisi, City of Madison Mayor Paul Soglin, American Family Insurance President, CEO and Chairman Jack Salzwedel, UW Hospitals President Ron Sliwinski, African American Council of Churches President Bishop Harold Rayford, Urban League of Greater Madison Board Vice Chair Derrick Smith, Centro Hispano Executive Director Dr. Karen Menéndez Coller, Oscar Rennebohm Foundation Early Childhood Program Director Jane Belmore and Wipfli’s Chief Human Capital Officer Claudio Diaz took part in panel discussions. Since the fall of 2014, the Delegation researched strategies that would decrease the number of families who are living in poverty and address the barriers for children and families of color in our community. 1. In collaboration with partners, stakeholders and the community, develop holistic, two generation, coordinated supports that empower young families living poverty to increase their economic stability. 2. Increase the number of young families living in poverty who gain family sustaining employment. 3. Increase the amount of and remove the barriers to affordable housing available to young families living in poverty. 4. Increase the number of children in poverty who are developmentally ready to be successful in school. *For the Delegation’s full report, please visit here. United Way will work with the community using the delegation’s strategies and will measure the number of families, especially families of color, enrolled and participating in the new, comprehensive, two-generational programming combining employment, housing and early childhood development that leads families out of poverty. United Way of Dane County is committed to the vision of a Dane County where everyone can succeed in school, work and life. Our community’s Agenda for Change are six goals focused on three priority areas of Education, Income and Health – the building blocks of a stable life. Through strategic partnerships and collaborative work, we are bringing the many voices of Dane County around a neutral table to find common ground and make progress, while providing organizations and individuals the opportunity to give, advocate and volunteer to change lives in Dane County. The Alliant Energy Foundation was formed in order to help improve the quality of life – now and in the future – in the communities where Alliant Energy has a presence. The Foundation’s programs reflect a commitment to play an active role in those areas and give back to future generations. The Alliant Energy Foundation is an independent, non-profit philanthropic organization funded solely by an annual contribution from Alliant Energy Corporation, using shareowner dollars.